It is 2:45am during the week of Summer Solstice in the mountains outside of Espanola, New Mexico, and I am awake in a tent watching my wife Kia sleep for a few moments longer. 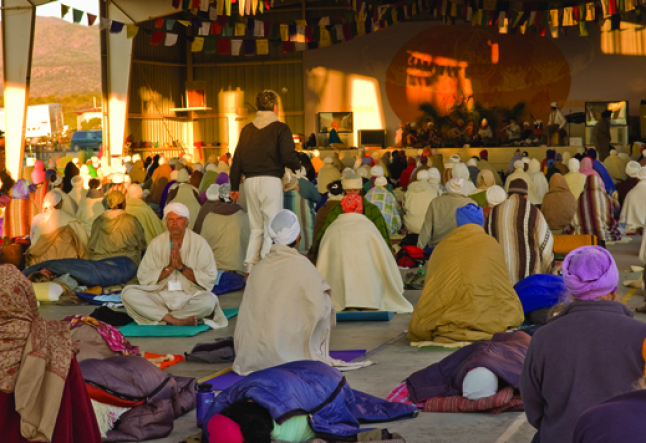 This is the third year that we have come to this powerful land to practice White Tantric yoga with several thousand people, Sikhs and non-Sikhs alike, from all over the world. Any minute now, a man with a long white beard wearing a turban and playing a guitar will walk every inch of this land repeatedly singing his early morning wake-up song, “Rise Up,” at the top of his lungs. This wee-hour minstrel is Guru Singh, one of Yogi Bhajan’s first students and a powerful teacher of Kundalini yoga. It just so happens he is also a talented musician who sings with a kind of soulful infectiousness that ruins almost anyone’s chances of actually staying in bed. I’m so tired it hurts, but to roll back to sleep carries with it a feeling that I will miss something important. I know I have to get up. Kia and I take the three-minute walk down to the Tantric shelter, an open-air structure where sadhana (morning practice) takes place. It would be pitch black if not for the incredible blanket of stars that extends from horizon to horizon in every direction. People walk silently in reverence to the sanctity of this special time of day known as the Amrit Vela or Ambrosial Hours. I gawp awe-struck at the stars as if I’ve never seen them before. Something begins to happen. We enter the shelter and sit down with our yoga mats, meditation pillows, sleeping bags and shawls to wrap around us in the chill of the morning. The space fills up quickly from 3:30-3:45 until there are about a thousand people. A light illuminates the stage where a man and woman sit and recite Japji, which is regarded by Sikhs as the most important set of verses from their holy book. This 20-minute-long hymn is sung in Gurmukhi, which basically means I do not know what they are saying. Nonetheless, the recitation is beautiful and there is a power to the tone of it. Simply put, it feels great to be seated upright on my meditation pillow next to Kia, surrounded by a thousand people all meditating in the middle of the night to ancient words I cannot understand. This is a total departure from anything I grew up with in terms of culture, education or spirituality, and yet I am feeling really good about being here. When Japji is completed, the lights are dimmed as a teacher takes the stage to lead us through this day’s Kundalini yoga set. 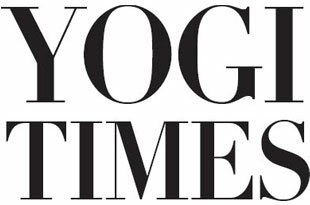 You never know what you are going to get in Kundalini yoga; there are thousands of individual kriyas (specific sets of poses), each with a unique purpose and rhythm. Today’s kriya is challenging both mentally and physically. I remember Yogi Bhajan’s words: “Keep up and you’ll be kept up.” Everyone is moving according to their body’s abilities, some quickly, some slowly, some perhaps more awkwardly than others, but we are all keeping up. I feel deeply connected with everyone here. Meanwhile outside, with each passing second, the world is perceptibly changing as the night transforms itself into day. I know this happens every 24 hours, but I never really make the time to observe it, certainly not like this. The yoga set lasts an hour. I am feeling a hum through my body, slightly electric, quite lovely. I feel alive. It is now time for the call of the day. We chant ek ong kar, sat nam siri, wahe guru for seven minutes. The sky has left its purple pre-dawn glow and enters into oranges and yellows. The sun is not far below the horizon. With the completion of this chant, we come to the final part of our Sadhana: a full-blown devotional concert. A multi-piece band takes the stage and we spend the next 75 minutes singing six different chants. Today’s instrumentation includes drums, tabla, guitars, harmonium and the angelic voice of Narinjin Kaur. This is not some shabby band with second-rate chops; these folks are proficient musicians bringing the highest vibe imaginable to the Tantric shelter at 5am! The purity of it is disarming to the point where I just start laughing. Then I look over at my wife and notice the tears pouring down her cheeks. We are so blessed. At 6:15am the final chant is completed. We are now in full daylight and the sun is on the rise. Kia and I gather our things and make our way back to our tent to prepare for the day. It seems as if there is a lot of time and space to do what this day will require of me. At every level of my being I feel calm. Remembering back to the tent this morning, I look to the sky and say, “Thank you.” I might have stayed in bed and missed this.